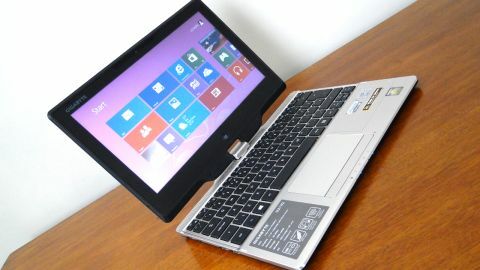 While this hybrid laptop makes for a fine ultrabook, its poor screen quality and hefty weight result in a lacking tablet. An Ultrabook and a tablet. Two devices for the price of one. That's the Gigabyte U2142's primary sales pitch. But does it add up? Not all that long ago, it wouldn't have had a hope. There simply wasn't an operating system fit for dual-role duties. But now there's Windows 8, built from the ground up for precisely this bi-polar portable proposition. OK, Windows 8 is far from perfect. In fact, it's shot through with niggles and annoyances. But it's still the best full-power, dual-mode OS for laptops and tablets yet. And it is usable. Whatever, it would be unfair to hold Gigabyte to account for Windows 8 deficiencies. But what we can do is assess it as both a laptop and a tablet machine. Does it truly deliver, or is it a bit pants at both? We can also size it up against the competition. That's probably the trickiest task, both in terms of picking the Gigabyte U2142's adversaries and for the Gigabyte itself. The competition is getting tougher by the moment. First up, the tablet-convertible market is a bit of a minefield of form factors, shapes, sizes and swivelling screens. There are systems where the screen and keyboard segments entirely separate, like the HP Envy x2. Then there's the solution Gigabyte has gone for, which involves a central swivelling hinge that allows the screen to rotate through a 180 degress and then fold back flat on top of the keyboard. Lenovo's Thinkpad Twist uses a similar swivel solution. You'd probably have to the likes of Dell's XPS 12 that achieves essentially the same result courtesy of a screen that rotates around hinges half way up the bezel. You could also argue that more straightfowardly pure tablet devices like Microsoft's Surface Pro should also be on your shortlist. Yup, it's pretty complicated. The next problem involves changing technology. The Gigabyte U2142's Intel Core i5 processor is based on the Ivy Bridge CPU architecture. And that's just been replaced by a whole new family of Haswell chips. This isn't an absolute deal breaker. Ivy Bridge CPUs still have plenty to offer. Until a few weeks ago, it was the prevailing latest and greatest mobile PC technology available to mankind. But it certainly needs to be factored into your buying decision. No, if the Gigabyte U2142 does have weaknesses, they're elsewhere, including the modest 1,366 by 768 resolution of its 11.6-inch LCD display. With 1,080p panels becoming the norm on smartphones much less laptops and tablet convertibles, is that good enough? Time to find out.